He started helping others through a company that adapts vehicles for a person with a disability. Getting back on the road, to go where I wanted to go when I wanted to go was so important for me. This was the beginning when he realized by helping others made his life so rewarding. If it was that important for me to get back on the road, I knew I can show others how easy it can be to get back on the road of life. 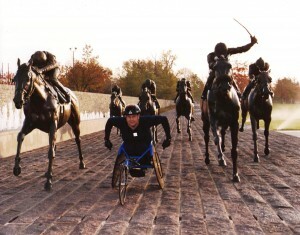 He got on the road in 1982 with his first wheelchair race. He moved to Kentucky in 1994 and 12 years later, he was training for a marathon when he suffered his second major accident. In July 2006, while speeding down a steep hill in Shelbyville during a training run, he encountered a pickup truck on the other side of the road. While trying to move over, he lost control of his wheelchair and slammed into the driver’s door of the truck. He sustained an open fracture of both scapula and collarbone, two broken ribs, a punctured lung, a spinal compression fracture and the avulsion of part of his scalp. It was 94 degrees that day. “It’s an accident, so, ‘Don’t touch him, don’t move him,’” medical technicians said. Typically that is a good idea but unfortunately I was lying on the hot asphalt, and burned 60 percent of my back. The accident led to one helicopter ride, two hospital stays, three rehab stints, four operations and five months out of work. I was motivated by the need to race, to push myself. 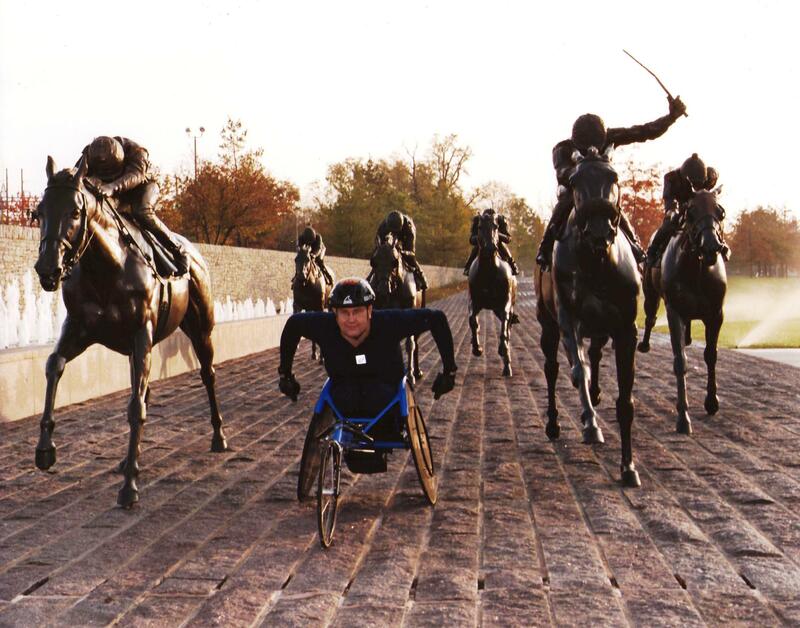 So Paul set out to tackle the world’s premiere wheelchair marathon in Oita, Japan. In 2010 he did just that. Having reached such an incredible goal, he was left wondering where he would find his next motivation. Then Paul remembered Christopher Reeve and his equestrian accident. He reflected back to all the times he too had come so close to having a similar accident with the uncertainty of riding horses. Paul watched Reeve struggle with what was such a slim chance of gaining movement back to helping increase those odds for others through his foundation. Paul found it rewarding to see the burst of new research with new ideas for therapy – both which changed greatly because of Christopher Reeve. Now what once was a slim margin for so many spinal cord injury victims of getting any movement back has now increased. Now those affected by spinal cord injuries do have a better chance of getting movement back and some full recovery. That is the main reason he races … to “set an example for others” with disabilities— to help them see through the fog of their challenges so they can focus on the clarity of living life to its fullest. To reach Paul email at paul@50abilitymarathons.com or call (502) 724-2300.